With the chillier weather among us, I thought it was only fitting to get out the pumpkin and start baking! In this recipe I combined my two favourite muffins: pumpkin and banana. These are unbelievably moist, slightly spicy and totally irresistible! It’s been my experience that anything gluten-free immediately projects an image of dry, dense bread to most people, but I hope I can prove you wrong with this recipe. The buckwheat flour, bananas and the addition of xanthum gum (a baking ingredient that maintains moisture) really make this bread moist and delicious. 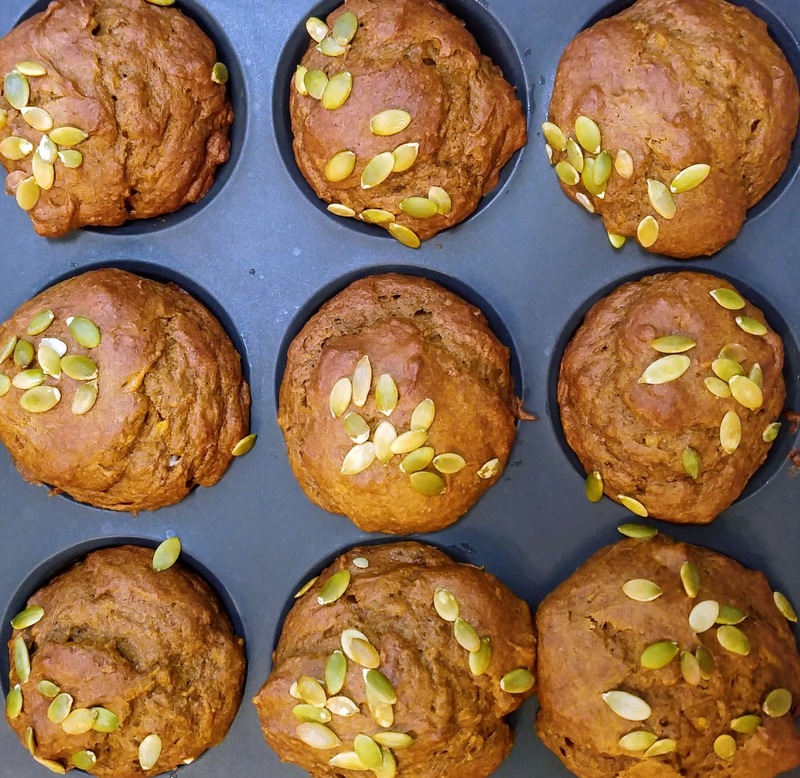 The secret ingredient that sets this pumpkin muffin recipe apart is the addition of cardamom-a member of the ginger family, a known digestive aid and energy booster. Cardamom’s distinct spicy taste complements the ginger, nutmeg, cinnamon and cloves in this recipe perfectly. In a large bowl, mash bananas and mix with pumpkin, coconut sugar, eggs, vanilla and olive oil. In a separate large bowl, mix buckwheat flour, xanthum gum, baking soda, baking powder, and all spices. Slowly mix dry ingredients into wet ingredients until incorporated. Spoon batter into greased or lined muffin tray. Top with pumpkin seeds. Bake for 30 minutes. Let cool on rack before eating.